“No!” I replied, I am so tired and have such a long day ahead, please just a few more hours. I reluctantly pulled myself out of bed, threw on the same clothes I wore the day before, brushed my teeth, grabbed my basket with wild-crafting materials and headed to the forest like a grumpy teenager forced against her will to attend high school. When I saw the way the morning light beamed across the path before me, all my angst disappeared. The voice was right. This forest was full of magic and I did not want to miss this opportunity. I knelt down, tied my boots tighter, said a brief prayer for the beauty of the Earth, and then headed up the trail. As the first light of the day kissed the morning dew on the stone beneath my feet, I was being guided further into the forest where there would be a big surprise. The air was still. Birds were sharing their morning songs. My inner chatter was drowned out by the deafening peace of the early hours. 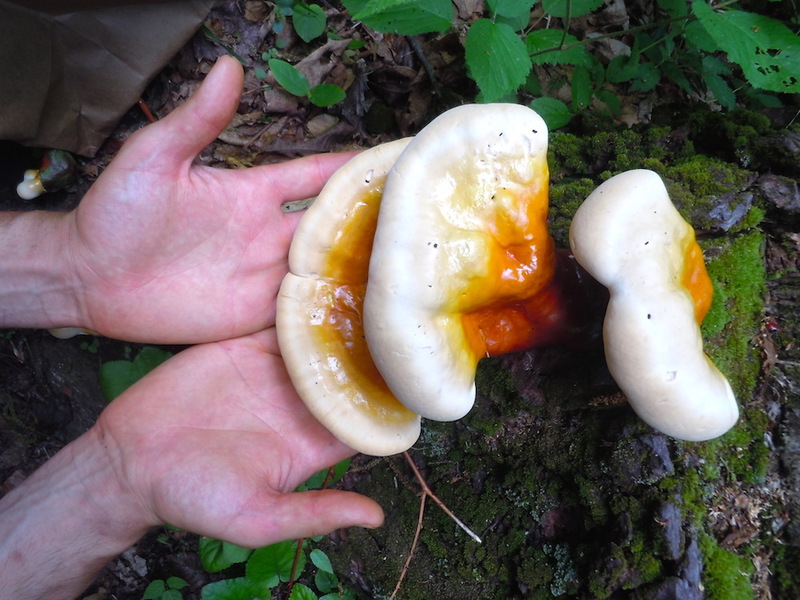 I spotted the first reishi mushroom on a large fallen hemlock tree- their undersides so white and cool to the touch and tops so deep red and golden. I smiled and offered my heart to this incredible mushroom. Then, I set a strong intention to use its medicine for healing my community. As I knelt beneath the canopy, I could feel my heart opening to the wonders of the forest floor. I felt a sense of acceptance, that everything was alright. Every time I discovered a new flush of mushrooms, I would spot another one nearby. It felt like a special treat to be surrounded by so much incredible medicine! After harvesting the larger, mature mushrooms, I had a strong urge to meditate. Rarely does this happen, so I decided to listen to this intuition and continued up the trail to find a sunny spot to sit. Suddenly, I heard a loud “Whoooooo,” and right before my eyes an enormous bard owl flew above me into a tree! I stopped in my tracks. After several minutes I began walking again and when I reached the top of the hill, I had a perfect view of this ancestor spirit animal above. We stared at one another. The owl’s dark eyes looked right through me deep into my soul. I breathed for several minutes with my eyes closed and when I opened them the owl was staring uphill. 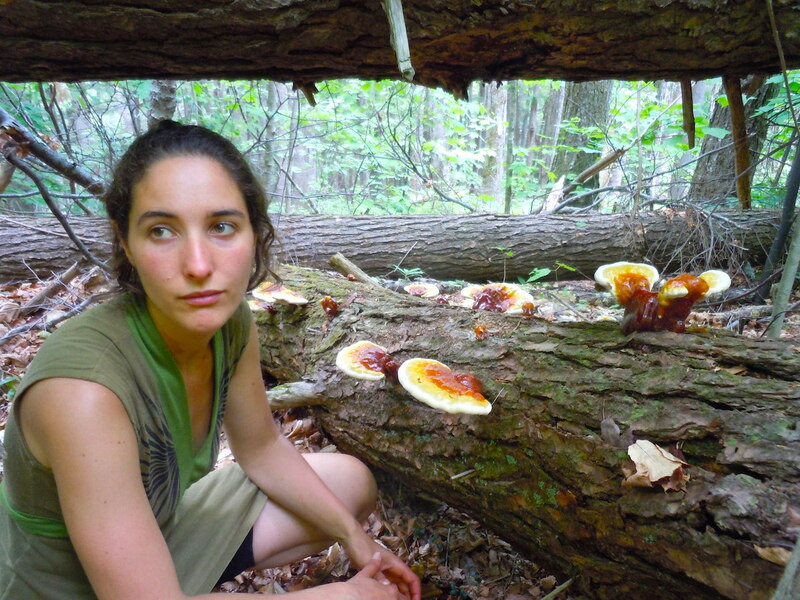 I looked and there behind me were yet even more reishi mushrooms. Because I felt I had enough I did not intend to check them out, but the owl insisted with her intent stare. So, I gathered my damp and deteriorating paper bag of reishi to head further uphill. Instead of walking to the tree I originally saw, I spotted another, larger tree so I checked it out. 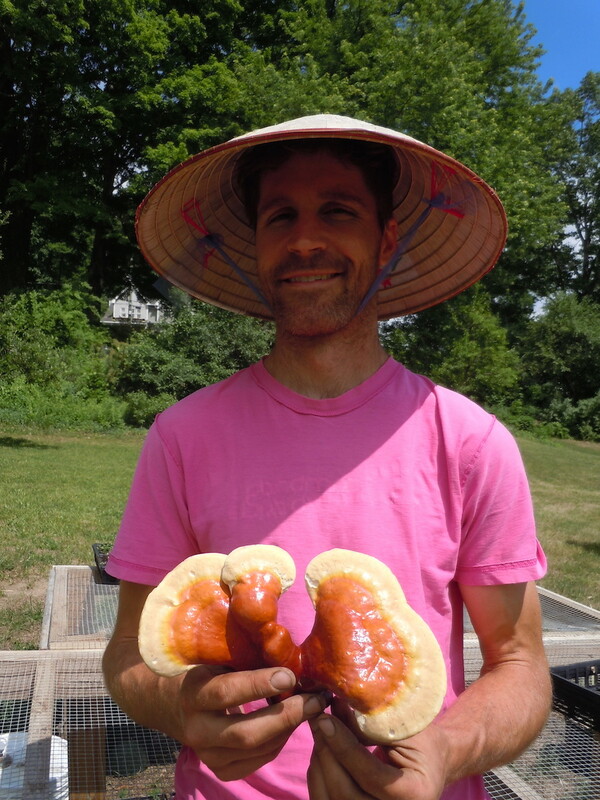 On the opposite side I found three enormous reishi mushrooms I fondly call the Grandfathers. 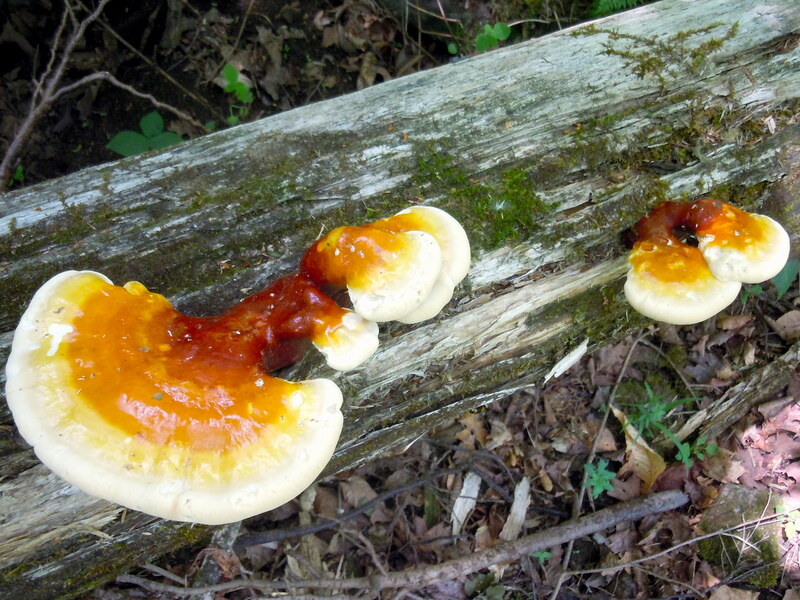 These beauties were about 8 inches in length and had a deep reddish brown varnish on top. 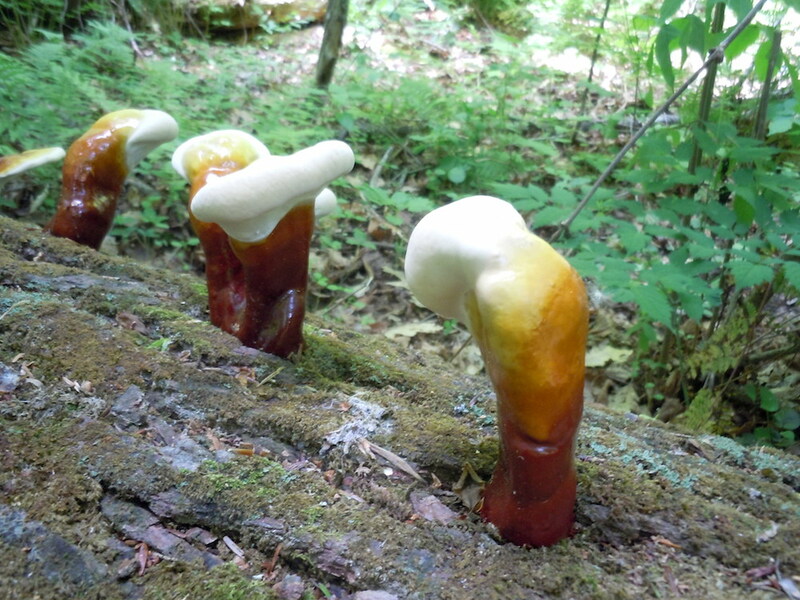 I imagined these Grandfathers were the original spores of the forest, which spread to all the other trees downwind. Just another day in the life of a medicine woman! What a wonderful story! I learned about a healing mushroom too. I see so many different species in the Smokies….so much to learn. I didn’t catch from your article where these grow? Thanks for sharing.